The Rev. 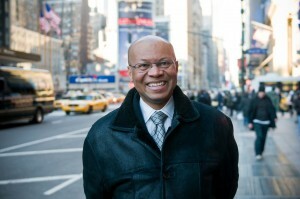 Dr. Willard Ashley was driving to the doctor’s office in Englewood, N.J., when the planes hit the World Trade Center. The senior pastor and founder of The Church of Abundant Joy in Jersey City wasn’t quite sure what had happened. “I thought maybe a crop duster had hit,” he recalled. By the time he pulled into the parking lot, the radio news was reporting a terrorist attack. As a pastor and psychotherapist, he had mixed feelings about whether he should even bother with his doctor’s appointment. It all seemed so inconsequential now. This feeling would be one that would define Pastor Willard throughout the recovery efforts and for years afterwards as he counseled not only his congregation members, but also fellow clergy. Transformations and renewal happened to all of us following September 11. As you approach the 10th anniversary of that tragic day, how have you been transformed? This entry was posted on Friday, June 24th, 2011 at 1:27 pm	and is filed under Uncategorized. You can follow any responses to this entry through the RSS 2.0 feed. You can skip to the end and leave a response. Pinging is currently not allowed.